If you ever make long distance calls or use those annoying calling cards – you understand how troublesome the process and workflow can be. From finding an appropriate calling card to entering a large serial number and then finding out you mis-typed a number and have to do it all again. 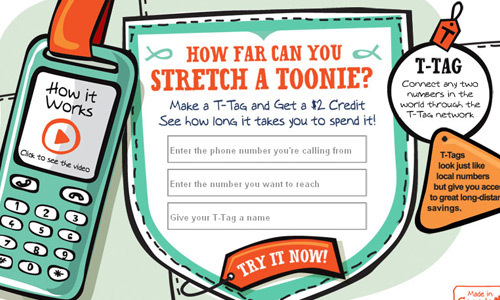 Those are just some of the hassles being tackled by Toronto based new startup T-Tag Systems. For now the startup is focused on serving Canadian’s; however the company expects to expand T-Tag into USA and Europe by the end of this year. 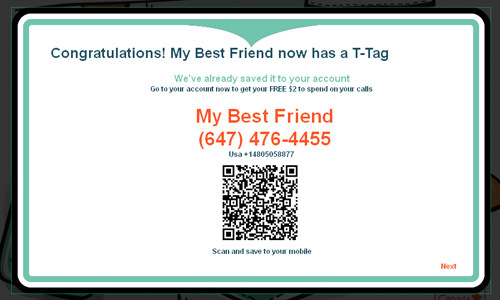 And if you signup right now you can get a $2.00 credit to try out T-Tag for free, without having to put down any payments up front, plus if you refer a friend you get a $10.00 credit to your account for each referral, and for every minute you talk to love ones you earn bonus credits – no wonder T-Tags can offer seventy to eighty percent savings compared to the big-market telecommunications providers on long distance calls. To those in Toronto and attending the National Home Show from March 16 – 25, head over to the T-Tag exhibit and learn more about how long distance may never be the same again.